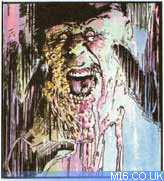 MI6 looks back at the comic Shattered Helix #2 "A Cold Day in Hell, Chapter 2" released by Dark Horse Comics in July 1994. 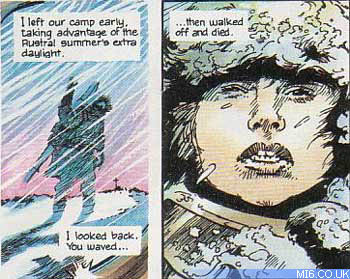 "A Cold Day In Hell" picks up moments after the end of Issue #1, with the convoy of soldiers and Bond heading to the secret laboratory. Mr Barclay, a leading member of Cerberus, and his entourage have arrived at the lab. They lay in wait for Bond and company with a deadly ambush. With the death of the entire accompaniment of soldiers bar one, and a very narrow escape (which is captured in a tour de force by "Lloyd and Jackson"), Bond, Serena and Marine Jenkins head towards the lab, hoping to destroy it. Bullock manages to kill Jenkins and capture Serena, and uses this as leverage to bring Bond out of hiding. Once captured, Bond sees Professor Boyce carrying the deadly DNA mutagen out of a secure vault, and a fight ensues which results in the virus being released. 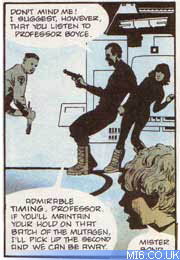 Bond flees with Serena in hand, and set off the auto destruct to the lab. 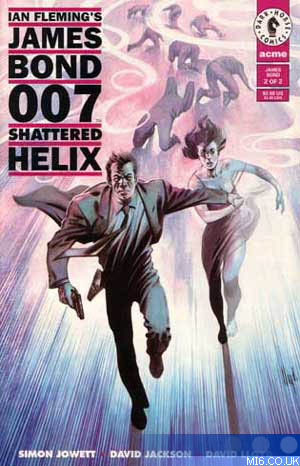 Above: Cell from "Shattered Helix #2"
On the way out, Bond is faced by Bullock carrying the second and final canister of the deadly DNA mutagen. With a single shot and smart thinking, Bond kills the armour enhanced henchman. After their escape, Miss Mountjoy continues the environmental subtext as they witness the final destruction of the lab. 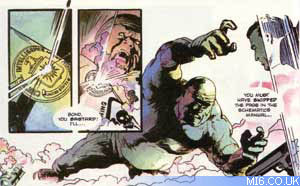 Above: The opening panel of "Shattered Helix #2"
Above: Bullock makes a final attempt to kill Bond. Bond and Miss Serena Mountjoy are seen running from the effects of the deadly virus. The dynamic cover shows fear in the face of Bond's companion. In the background, figures agonize in pain as snake-like wisps of the DNA mutagen rap around them - but fail to reach the escaping Bond and Serena. The cover for this issue is one of the best from all the 1990's James Bond comic books. The high standard continues in issue two, and earlier concerns over the quality of Miss Mountjoy are put to rest with great detail work throughout the issue. A cold, bleak look is created giving the environment character, conveying the cold inhospitable Antarctic and submarine like laboratory. The ambush on the open snow is a further testament to the use of shading and colour. Bullock's gruesome death is captured in a single cell and gives a great sense of dread. With more exposition present in part two, and more information to get across to the reader, it has been achieved without slowing the pace. The structure and sharp use of language and abbreviation continue in this concluding part. Bullock: "Brains on top 'a beauty. Who'd'a thought I had both?" Plot: Bond must stop Cerberus stealing a deadly mutagen, and releasing it upon the earth.